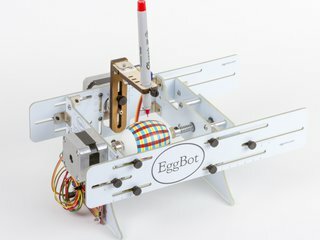 The EggBot, evolved and refined. Better rigidity, faster setup. Solidly constructed from machined aluminum. Most popular model. Includes several helpful upgrades from the Basic. Extra large chassis to fit larger objects like ostrich, emu, and rhea eggs. 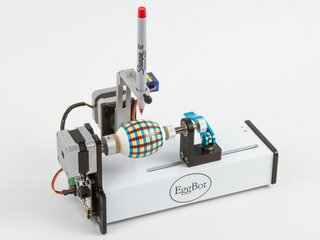 1 The EggBot Pro has enough "reach" to print on an object of arbitrarily small size, however there is a practical (but poorly defined) limit on how small of an object you can print upon, that has to do with the size of the "egg couplers" that hold the object in place. It is challenging to print on objects much smaller than one inch in length or diameter without special fixtures. 2 "Some Assembly Required." 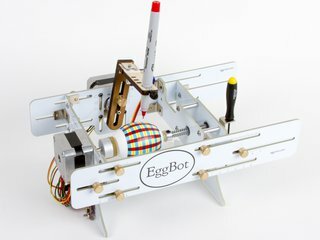 The Deluxe, Basic, and Ostrich EggBots all require screwdriver-level assembly, and usually take an hour or so to build, following along with our detailed photo-heavy instructions. No soldering or programming are required. 3 Typical values, when configured to print upon a chicken egg. 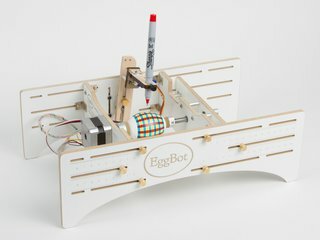 4 Egg-Bot kits are compliant with Open Source Hardware (OSHW) Definition 1.0 [link]. Documentation is hosted at the Evil Mad Scientist wiki.